A rendering for in Jer. v. 27; but it is doubtful whether this translation is accurate. 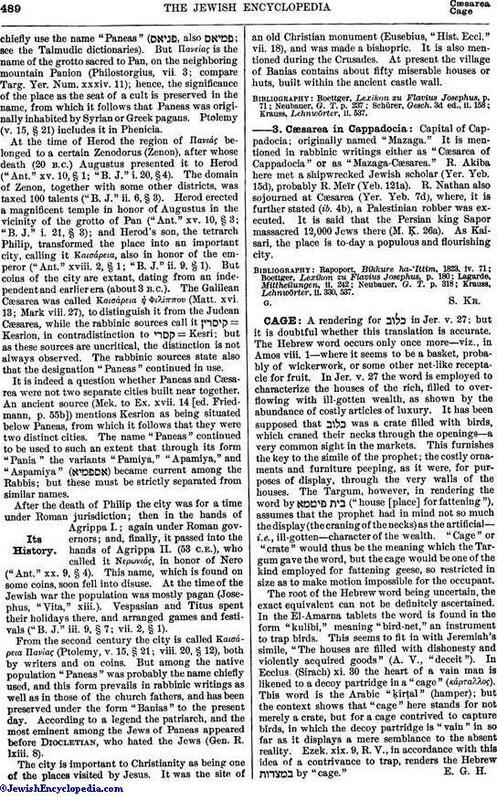 The Hebrew word occurs only once more—viz., in Amos viii. 1—where it seems to be a basket, probably of wickerwork, or some other net-like receptacle for fruit. In Jer. v. 27 the word is employed to characterize the houses of the rich, filled to overflowing with ill-gotten wealth, as shown by the abundance of costly articles of luxury. It has been supposed that was a crate filled with birds, which craned their necks through the openings—a very common sight in the markets. This furnishes the key to the simile of the prophet; the costly ornaments and furniture peeping, as it were, for purposes of display, through the very walls of the houses. The Targum, however, in rendering the word by ("house [place] for fattening"), assumes that the prophet had in mind not so much the display (the craning of the necks) as the artificial-i.e., ill-gotten—character of the wealth. "Cage" or "crate" would thus be the meaning which the Targum gave the word, but the cage would be one of the kind employed for fattening geese, so restricted in size as to make motion impossible for the occupant. The root of the Hebrew word being uncertain, the exact equivalent can not be definitely ascertained. In the El-Amarna tablets the word is found in the form "kulibi," meaning "bird-net," an instrument to trap birds. This seems to fit in with Jeremiah's simile, "The houses are filled with dishonesty and violently acquired goods" (A. V., "deceit"). In Ecclus. (Sirach) xi. 30 the heart of a vain man is likened to a decoy partridge in a "cage" (κάρταλλος). This word is the Arabic "ḳirṭal" (hamper); but the context shows that "cage" here stands for not merely a crate, but for a cage contrived to capture birds, in which the decoy partridge is "vain" in so far as it displays a mere semblance to the absent reality. Ezek. xix. 9, R. V., in accordance with this idea of a contrivance to trap, renders the Hebrew by "cage."